Hello, and welcome to your unofficial meal: easy delicious hummus toppings starring and sponsored by Sabra hummus. I really love being a Sabra Tastemaker. I really do. It’s not just the free hummus (free hummus!!) but their campaigns push me to use hummus in ways that I may not have thought of before. Like that savory doughnut post–it would never have occurred to me, and they were delicious! Today’s post is no different: we’re talking The Unofficial Meal. You know the one. The snack before the meal. The pre-dinner snack. I am all about the snacking. I love to cook, and eating while cooking is just about the best. I put together two easy delicious hummus toppings that, once made, can hang out in the fridge for a good 2-3 days so they’re ready to serve at a moment’s notice, whether you know you have a big dinner party coming up, it’s an impromptu cookout, or you just need something for your family to snack on while you finish up making dinner. Here’s a fun video I made, starring The Beloved in his first turn as a Silent Movie Star. 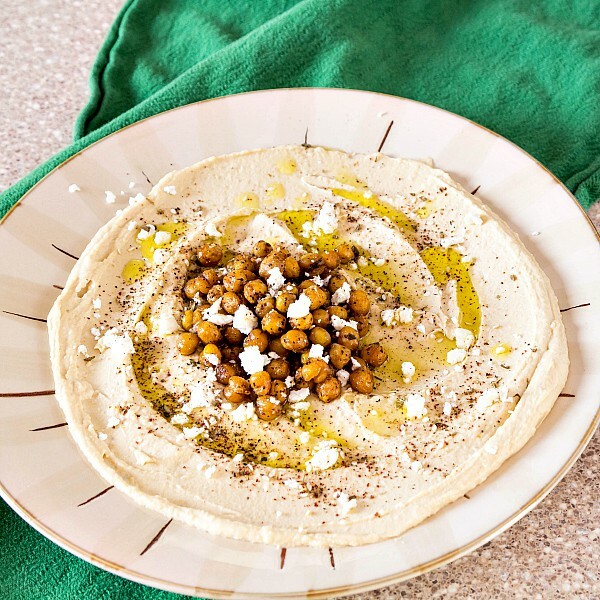 Plus, you’l see just how simple it is to make these easy delicious hummus toppings to have on hand for your next Unofficial Meal! 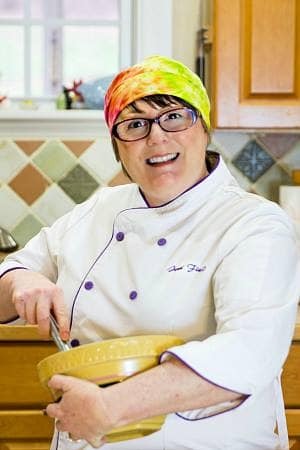 As luck would have it, we were shooting Cook the Book with Denise and Jenni on April 17, and we always serve snacks for folks to munch on while we’re cooking. For today’s unofficial meal, I topped Lemon Twist Hummus with a lovely and simple chopped Greek salad. A lovely mound of nutty, spicy zaatar-roasted chickpeas found its way on top of Classic Hummus. A drizzle of olive oil on each, a sprinkle of feta, oregano on the Greek salad and zaatar on the roasted chickpeas, and our unofficial meal was served. As we cooked and laughed and drank wine in the kitchen, folks grazed in the dining room. 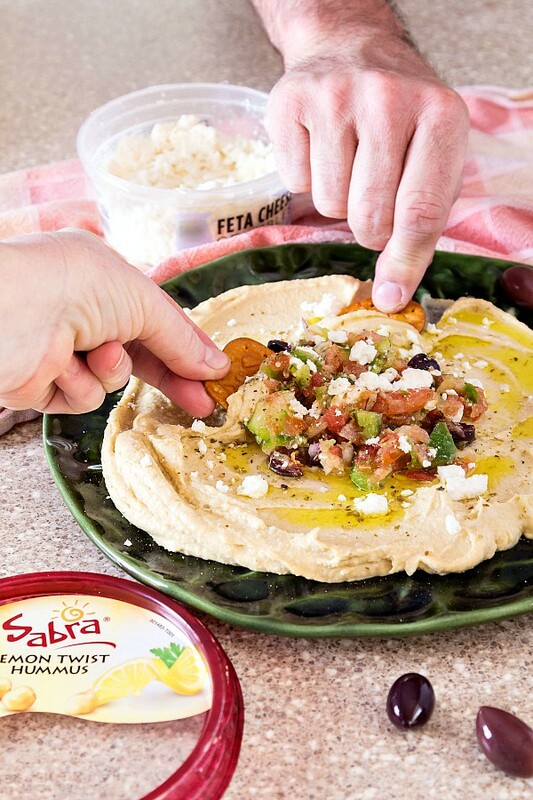 As delicious as Sabra hummus is straight from the container, there is something about spreading it out on a platter that invites more hands in at the same time. And then top hummus with something simple and delicious? The flavors and textures together turn hummus into the star of the show. Once shooting was done, we all sat down to a delicious meal together, and we continued our unofficial meal snacking right along with our official meal! I love your ideas! And your video. 🙂 The Greek salad has my full attention at the moment. Cooked, Laughed, Drank…gang’s all here! Love this! Thanks! It worked out so well, and Stephanie–the chef/restaurant owner who was on the show loved the topped hummus idea so much that she’s going to start doing her own take at her restaurant! Huzzah! You are my hero! Smart, talented, creative, and FUN! Aw, thank you, Jane! It was time to push back against the Tasty Videos! lol And thank you–our unofficial meal was so fun and delicious, and the official meal that evening was no slouch either! Haha, David! I think the question is, “When is it *not* acceptable to eat hummus?” I’ve had it for breakfast on many occasions! And if you’ve not tried the za’atar yet, you are going to love it. Wonderful on All The Things!